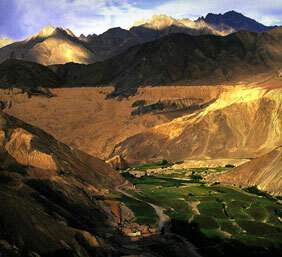 Sham valley is situated in lower Ladakh and the western part of Leh with beautiful landscape, villages and monasteries. The trek along this valley is a gentle trek as the highest elevation does not rise above 4100m unlike other parts of Ladakh. There is ample time to explore monasteries and Buddhist culture during the trek as each day of walking is relatively short. The trail crosses numerous villages, some of which are very rich in terms of agricultural produce and resources. The people here have kept their Ladakhi ways of custom and tradition intact. This valley is also known as Apricot valley due the abundance of apricot orchards. Sham valley starts from Nimmo village and stretches up to Mulbek village. On this route are famous monasteries of Ladakh like Bazgo, Likir, Saspol, Alchi, Ridzong, Mangue, Temisgang and Wanla. Almost all of them are accessible by road, but some may only be reached by trekking and hiking. Each monastery in Ladakh is distinct in itself and for those who wish to experience the uniqueness of Ladakhi monasteries, repository of age old Tibetan Buddhism, this trek is an ideal opportunity. There is also the option of staying in local houses during this trek as a part of our special service called village home stay, where you can experience the Ladakhi way of living and taste some of the home made local delicacies.